This past week saw Hugh and Juanita Friedline join us from the USA on a 10 Day Plains Game hunt. This was to be their first trip to Africa and what a trip it turned out to be. From the word go we knew hunting was going to be tough with a full moon and some of our areas having received better rains than others. Hugh was interested in a variety of Plains Game species and Juanita joined the hunt as our camera lady and observer. Luck came our way the very first afternoon when we bagged a Gold Medal Blesbuck. As if that wasnt a great start, a Blackbacked Jackal jumped up at the crack of Hugh’s gun,ran a few hundreds yards further and stopped,steadying himself and shooting off sticks Hugh made a 300 yard shot to bring down a weary old Jackal that had eluded us for some time now. 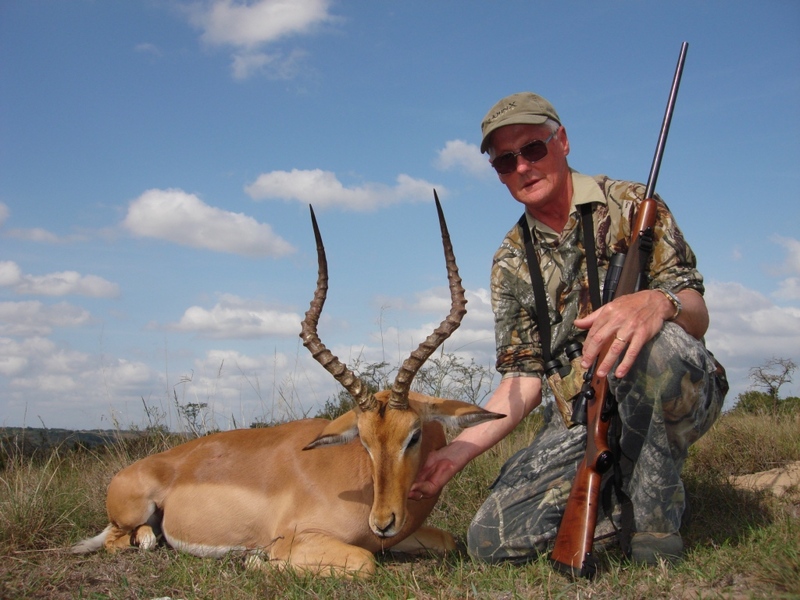 Hugh with a Gold Medal Blesbuck. 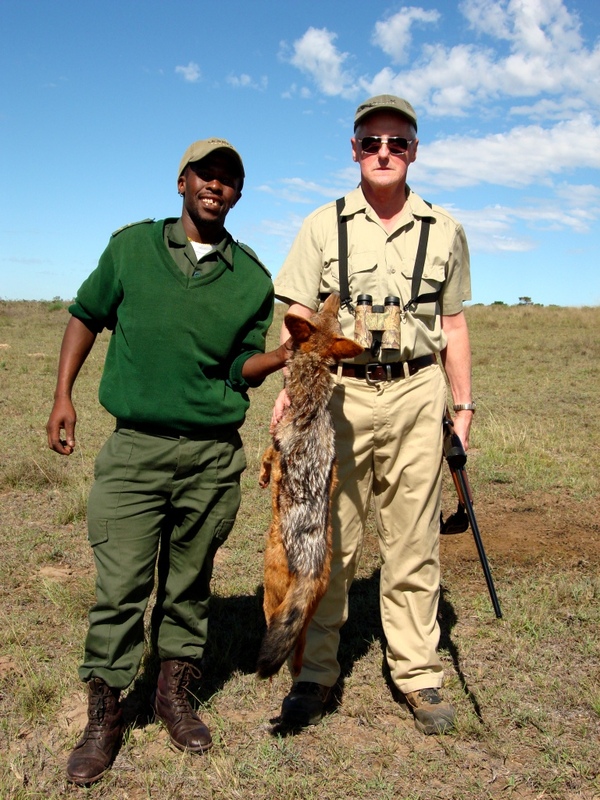 Tracker, Boy, and Hugh with Hugh's long-range Blackbacked Jackal. One of Hugh’s priorities on his safari was to hunt a big Warthog. For those who have hunted Africa and in particular Warthog, will know that finding a big Warthog is a big ask and one that requires a great deal of luck. Hugh ended up harvesting 2 great pigs. 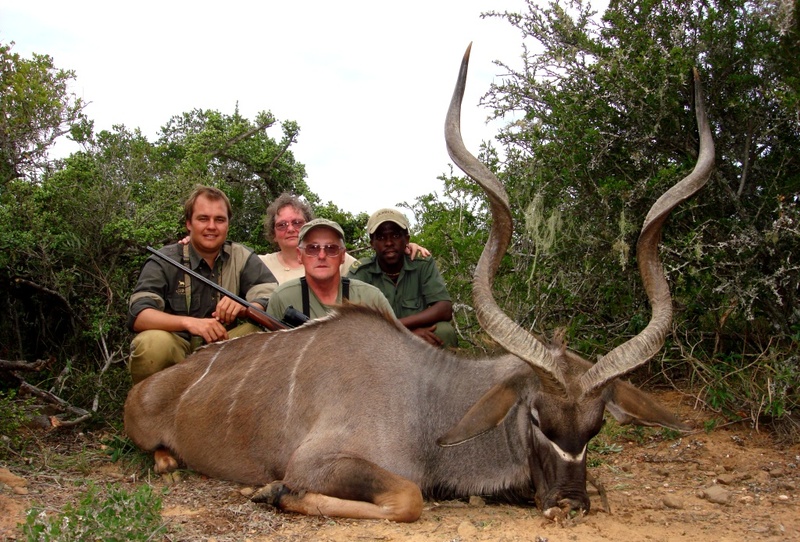 The first of his Warthogs came more as a surprise while hunting Kudu. Walking along fire breaks in the hope of finding a Kudu Bull sunning himself in the afternoon sun, we bumped into a very skinny Warthog, after studying the pig I asked Hugh to put him out of his misery as it was evident that it had been injured before and was in a terrible state. Afterwards it was found that the boar had been injured by another boar or possibly an old shot wound. The wounded old Warthog Hugh culled. 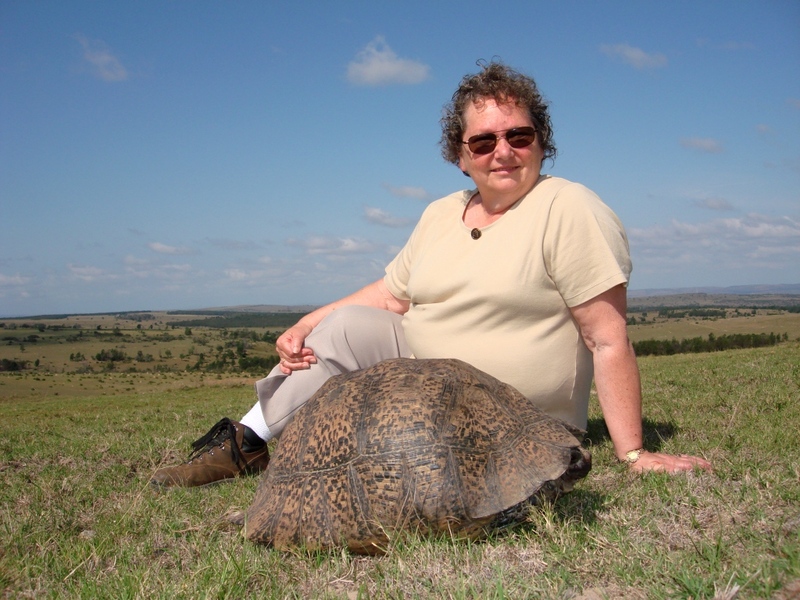 Juanita getting to know our wildlife a bit better - Leopard tortoise. The next morning we were up at 5am once again in search of East Cape Kudu and that elusive big Warthog. Upon entering the hunting area we spotted a Warthog in the distance, a great stalk was made and Hugh executed another well placed shot. What happened from there was pandemonium between yelps, hoots and high fives! Hugh wanted a big Warthog and we had achieved it. 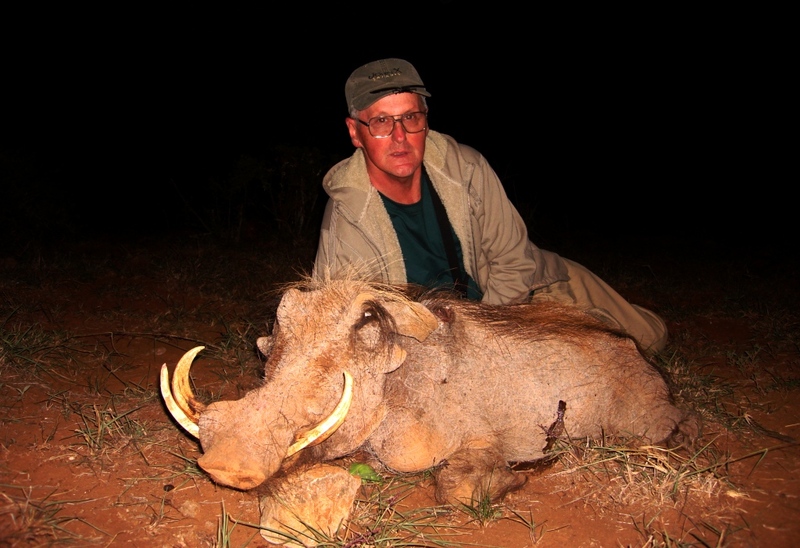 He not only had a big one, but probably one of the biggest Warthogs hunted in the last 5 years. 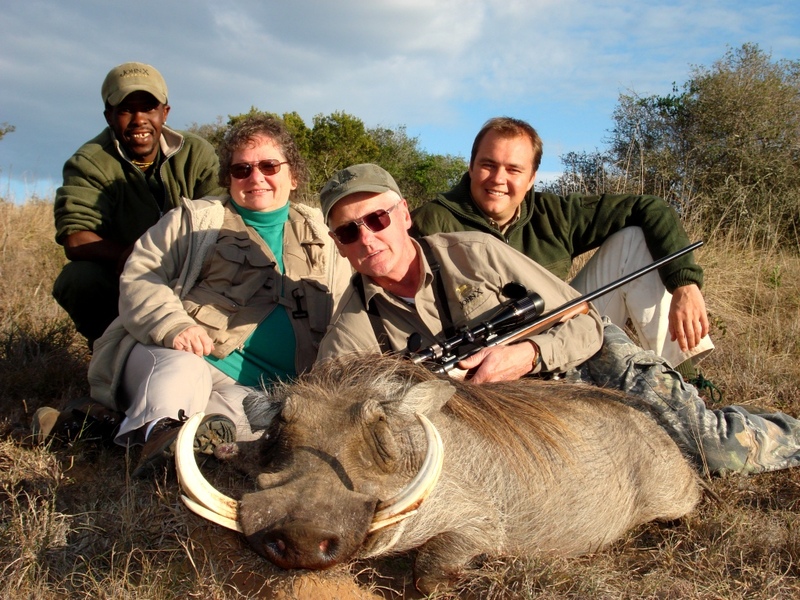 A happy team with a MONSTER Warthog! Our Warthog trophy had put us on an almighty high only to be brought back down to earth by our lack of success and continued bad luck with Kudu. 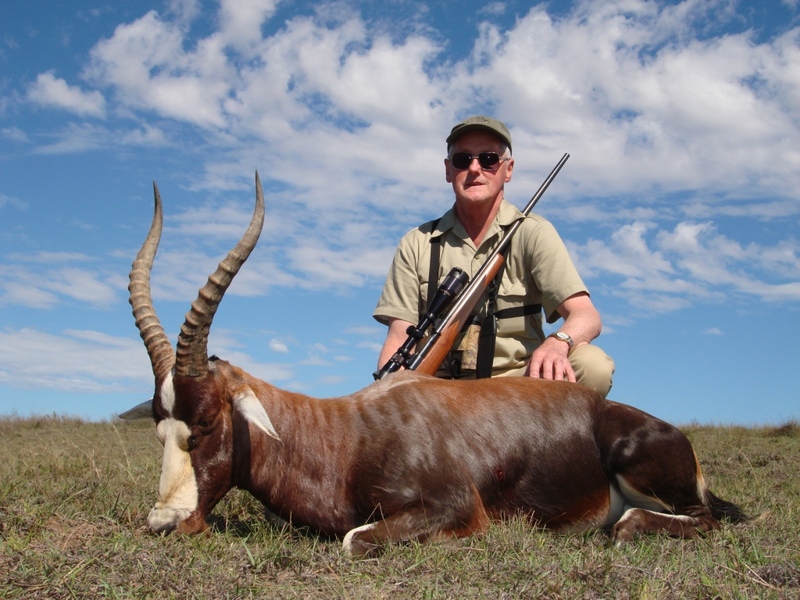 In the meantime we travelled to our Northern Area where Hugh harvested a super Gemsbuck bull. Camp in our Northern Area, nestled at the foot of the Loodsberg Mountains. Returning from the North, our East Cape Kudu quest continued. By this stage we were on day 4 of Kudu hunting, had passed up about 150 Kudu bulls, had walked many miles and our 5am mornings were starting to have its toll on all of us. Day 5 of Kudu hunting saw us heading into a third different area, and one that would make the difference. Spotting a Kudu bull at 08.30 in the morning, we started our stalk leaving Boy behind to act as our spotter while we tried to stalk into position. By 10.00 am we were a mere 200 yards away, having gained about 800 yards. The only problem we now faced, was that the bull had gone to bed down in the heat of the day. We decided to do the same and wait it out. Then, at 2.30 pm the bull did a strange thing, he got up from where he had bedded down and started feeding in the hottest time of the day. Hugh needed no invitation and executed a fantastic quartering away shot. A well deserved 50'' East Cape Kudu - Well done my friend! We ended a memorable hunt off with a fantastic Impala and celebrated our great adventures over a few beers on the last evening. A hunt that I for one will not forget for a long time, and one that I’m certain will be told about for many years to come around a camp fire in Pennsylvania! A super Impala - A great way to end a dream safari. Until next time my friends, I hope you both enjoyed it as much we enjoyed having you hunt with John X Safaris.